Most sites are approaching the start of second generation egg hatch. Once this date occurs, keep the fruit protected up until September 15. Second generation egg hatch will begin in a few weeks at most locations. In high-population areas, two cover sprays may be required. In low population areas, only one application is needed. Pay attention to apricots, which ripen earlier. 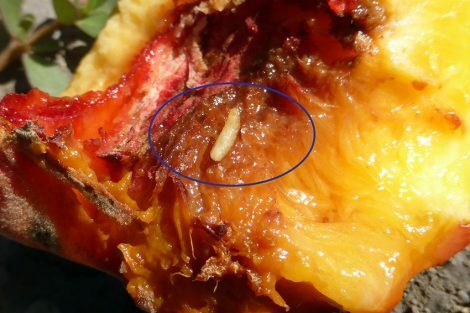 At this time of year, peach twig borer larvae will be entering fruit as they ripen. Walnut husk fly adults have a distinctive pattern on their wings. Walnut husk fly larvae in walnut husks. 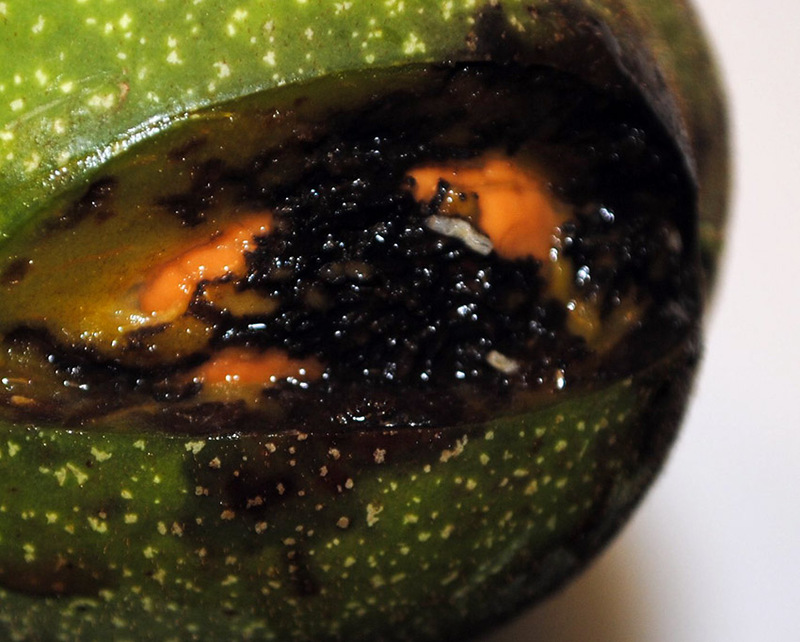 Walnut husk fly larva inside a peach. 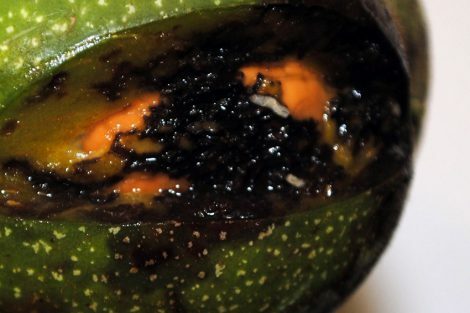 This is typically a pest of walnuts, but can attack soft apricots or peaches growing near walnuts. Flies are now starting to lay eggs. The peak fly emergence will occur in early to mid-August, so another application will be needed at that time. 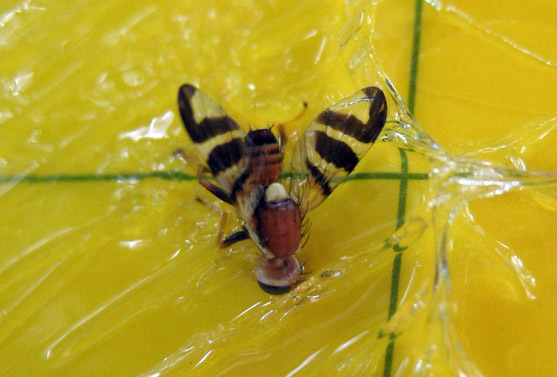 Populations of walnut husk fly can be reduced by removing all nuts that fall to the ground. To make husk removal of infested nuts easier, store them in a damp burlap bag for 2 to 3 days. 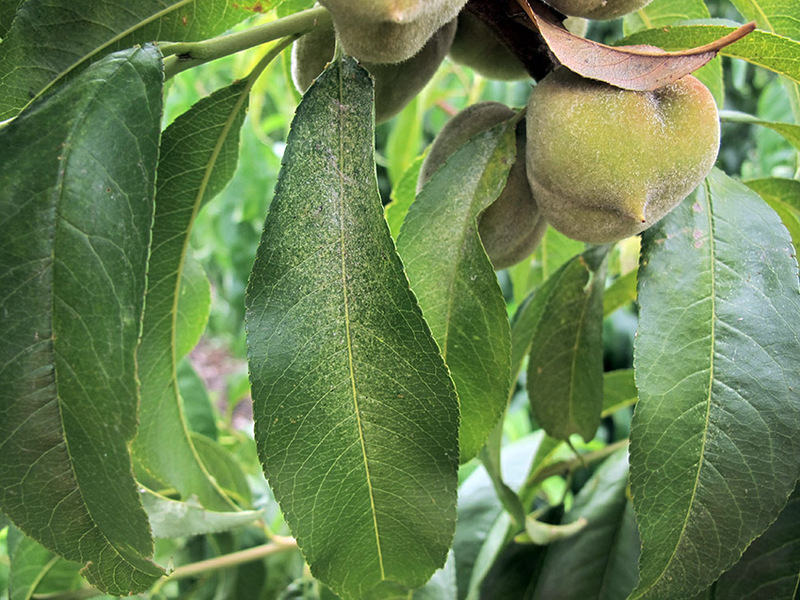 Applications you are making for peach twig borer (options are the same as for codling moth) will also target walnut husk fly on peach and apricot. Spinosad (many brands) is an excellent organic option. Spinosad can also be used on walnuts, up until one month before harvest. 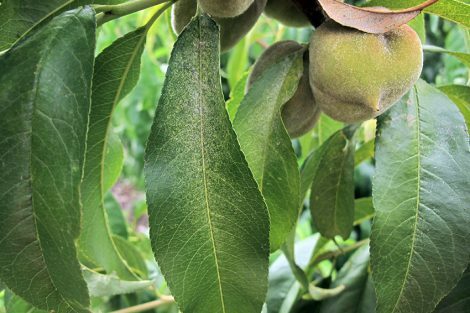 Spider mite feeding just beginning on peach, as mites move from the branch to the tip of the leaf. 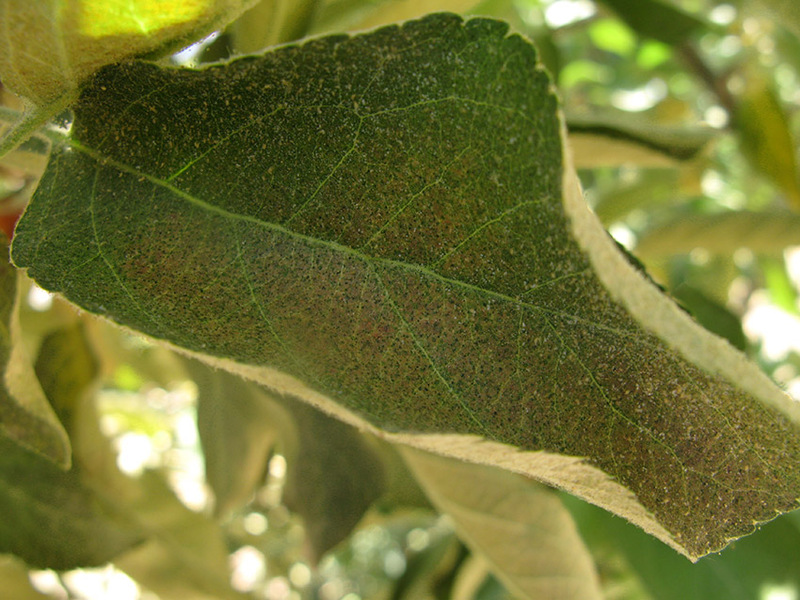 Heavy spider mite feeding on apples causes the leaves to turn bronze. Look for leaves that are stippled, and turn them over. 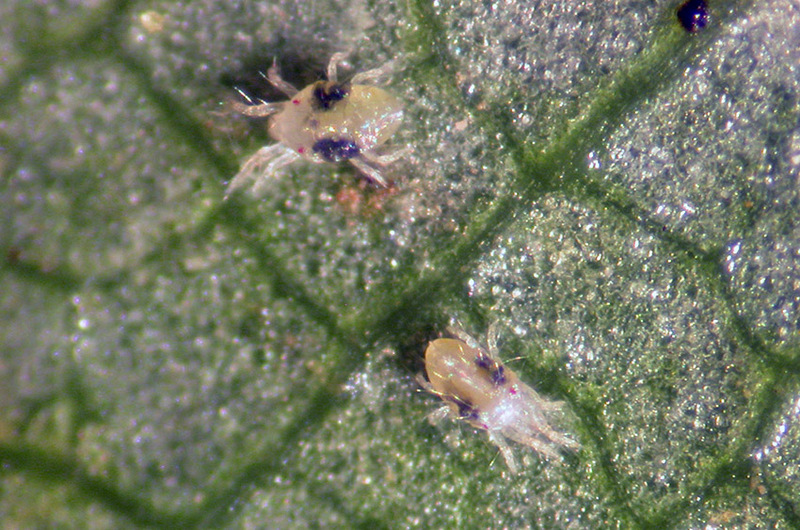 Using a hand lens, look for the slow-moving mites. 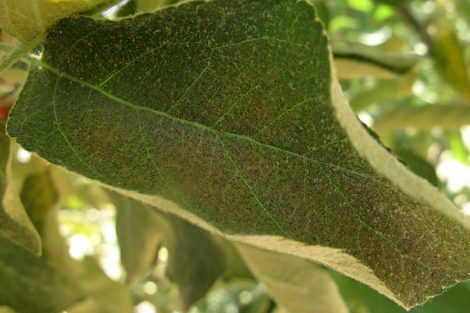 Before making a decision on whether to treat, also look for predatory mites within the pest mite population. These are faster moving mites, about the same size, that can prevent spider mite densities from exceeding economic thresholds. If predators are present, then a treatment may not be necessary. A 0.5-1% application of horticultural oil is very effective on mites, especially when populations are low, and when the spray coverage is good enough to cover the undersides of the leaves. 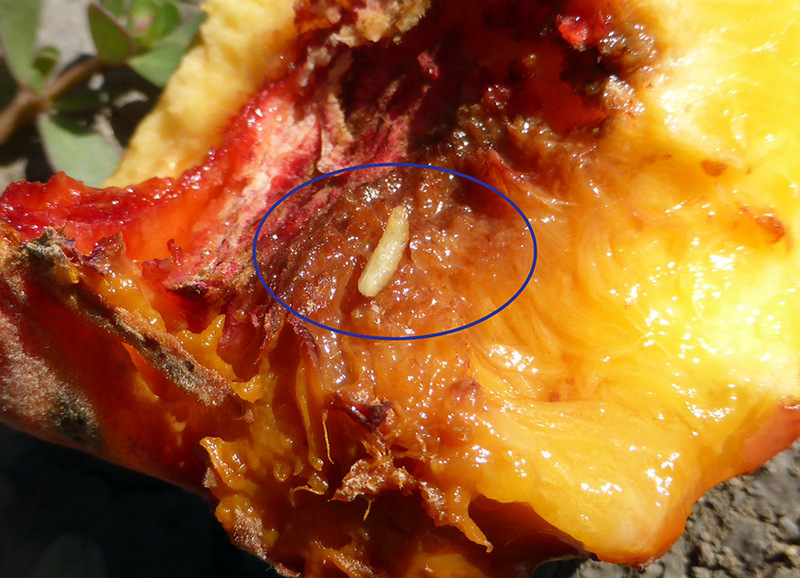 Greater peachtree borers feed on wood at the crown and in the upper roots. Protect the lower 12-18 inches of trunk for peach/nectarine, apricot, and plum. Start sprays now (if you have not already started) and keep protection on through September. Make sure the spray covers the entire surface area, particularly close to ground level, and any exposed roots. 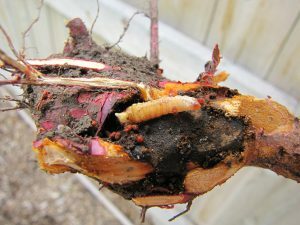 Young trees can be killed when trunks are girdled by feeding; older trees are weakened and become susceptible to attack by pathogens and bark beetles. Remove all weeds, grass, and excess soil from around the base of the tree. Heat and dryness reduce the survival of eggs and larvae. Avoid mechanical and rodent-caused injuries to trunks. 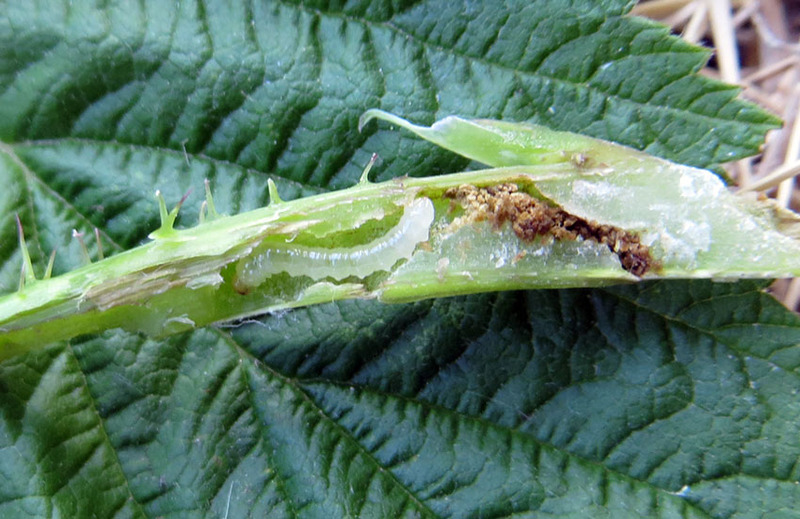 Raspberry horntail larvae feed in the tops of canes, causing wilting. When pruning out the tops of symptomatic raspberry canes, be sure to cut far enough down to get the larva inside. 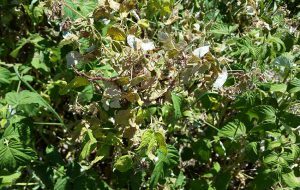 Raspberry fruits are in various stages of maturity in northern Utah. 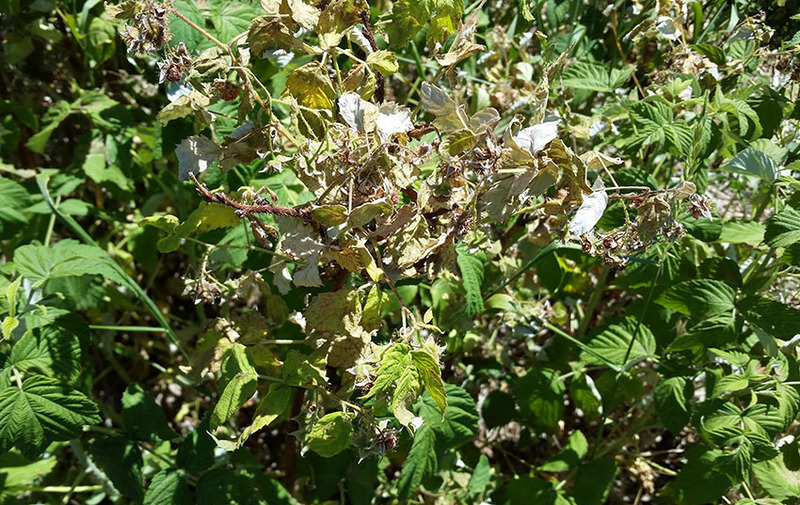 Damage from the raspberry horntail has been visible for a few weeks now. Now is the time to prune out the wilted portions of the canes and destroy the prunings. This will help to reduce the horntail population in your area. When pruning, be sure that you get the white larva inside the stem. It may be farther down the stem than you think. To get a feel for where the larvae are feeding, slice a few cut stems vertically to locate the larva. Where there is no borer, the pith will be creamy-white. A pith with loose brown material will indicate borer activity. Rose stem girdler causes single canes to die back. Rose stem girdler larva inside a cane. Another serious pest of raspberries is the rose stem girdler. The adult is a shiny, bronze-colored beetle. Adults are pupating now inside canes, and will be emerging starting this weekend to lay eggs. 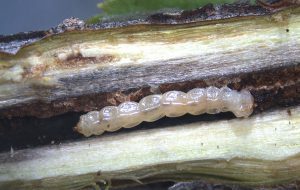 Females lay eggs near the base of the canes, and the larvae hatch and tunnel into the cane tissue. Canes may have swellings at the feeding sites, and infested canes may break at weak areas later in the season. The best treatment option is to remove and destroy infested canes late in the season. 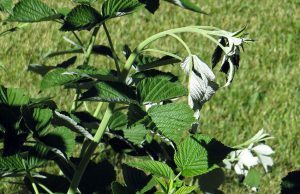 For fall-bearing raspberries, be sure to cut all canes to the ground this fall to remove any borers inside the canes.